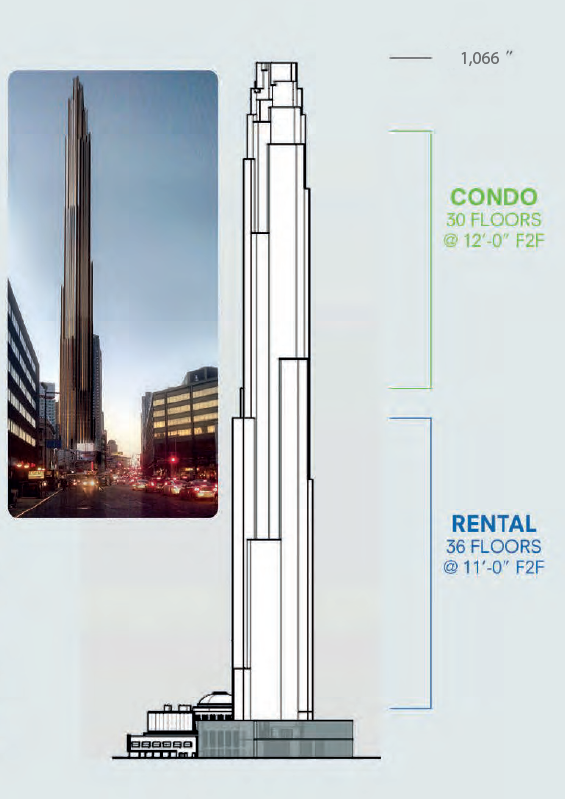 73-story tower will span 556,164 square feet. Commercial portion, 93,000 square feet. The Brooklyn skyline is changing! 9 Dekalb Ave, the next iconic landmark of Brooklyn, will transform Brooklyn’s skyline, putting it on the sky map. The new tower will stand 73 stories and 1,066 feet tall (325 meters), making it the first building in the borough to hit quadruple digits in height and becoming the tallest tower in the 5 boroughs outside of Manhattan. 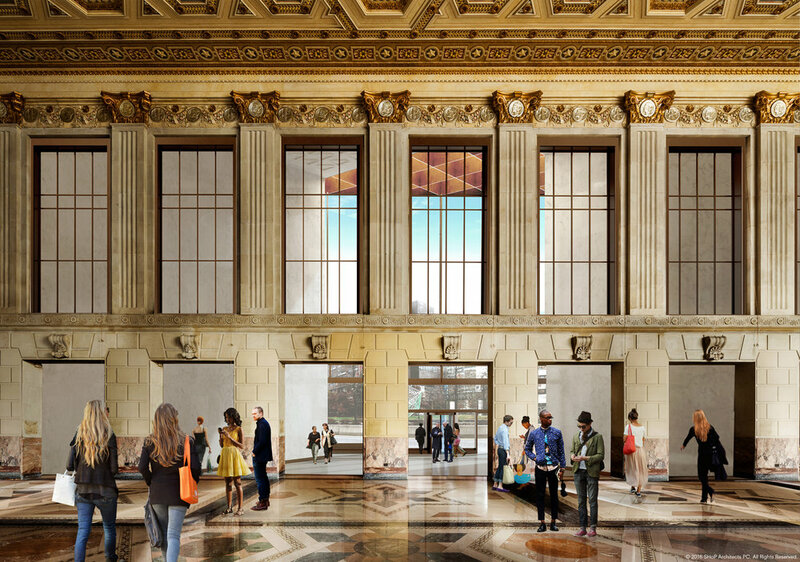 Fused to the 1908 Dime Savings Bank building, which was designed by Mowbray & Uffinger and landmarked in 1994 and drawing from the landmark on-site, the spacing of the tower’s vertical facade elements mirrors the spacing of the bank’s neo-Classical columns. The color and materials palette pick-up on the bank’s colorful stone interiors, which will be converted to retail, while parts of the bank’s roof will be used for the new building’s private outdoor spaces and a pool. 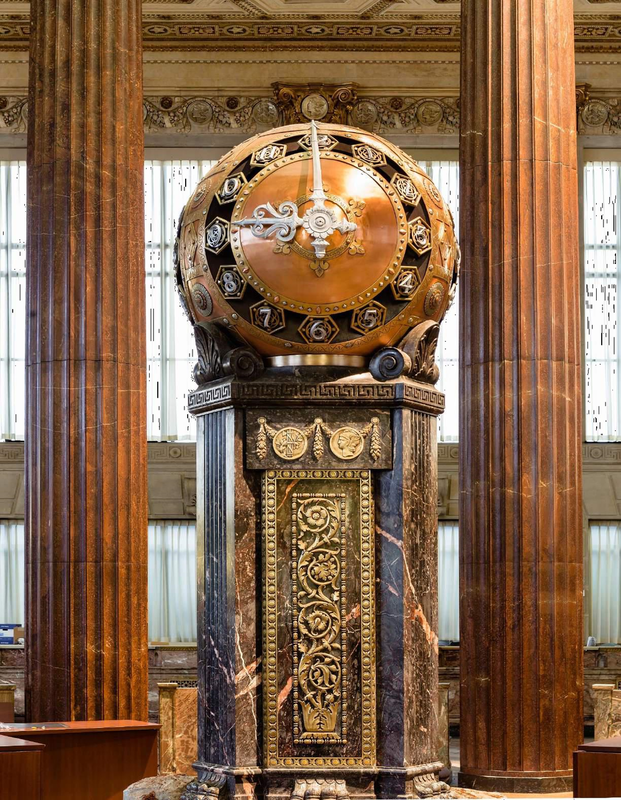 The Dime Savings Bank is one of select few landmarks that is still privately owned. 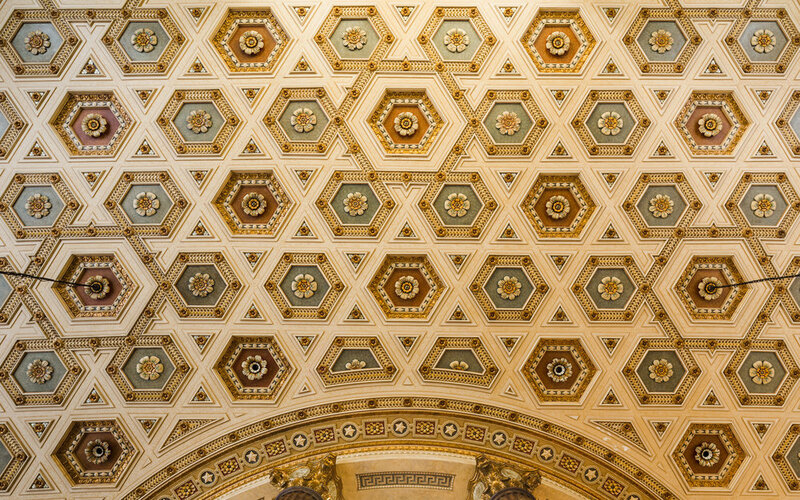 The design for the Tower’s unique shape was inspired in part by the hexagonal footprint of the Dime Savings Bank. The dark vertical lines of the building echo some of the bank’s architectural details. The facade detailing is such, that when two sides of the hexagon are viewed from an oblique angle, it will resemble one face, a sleeker reference to the grand old New York skyscrapers like Rockefeller Center and the Chrysler Building. Clad in glass and bronze with an interlocking hexagonal design that tapers as it rises, the tower repeats features and patterns of the historic site into a cinematic expression of the rich past and future of Brooklyn. Ackerman Development is working in partnership with JDS Development with the striking façade being designed by SHoP Architects. Upon completion, the building will offer luxurious condominiums for sale, located in the top part of the building. To put it into perspective, the lowest floor apartment for sale in the building, will be higher than any penthouse available in Brooklyn. The rest of the residential apartments will be rentals, 30% of which will be allocated as affordable units. The new tower will be a major first for Brooklyn, taller than anything currently standing in Brooklyn by almost 500 feet. Towering over the outer boroughs, 9 DeKalb will offer a one-of-a-kind luxury high-rise experience, with unobstructed views in every direction, condo-level finishes, and the most luxurious amenity package found outside of Manhattan. It will permanently alter the skyline of the borough and change the feel of the historically low-rise Downtown Brooklyn, bringing the borough one step closer to Manhattan-like density and height. The building will be visible from all over Brooklyn, and its distinctive facade will reinforce its prominent position on the skyline. 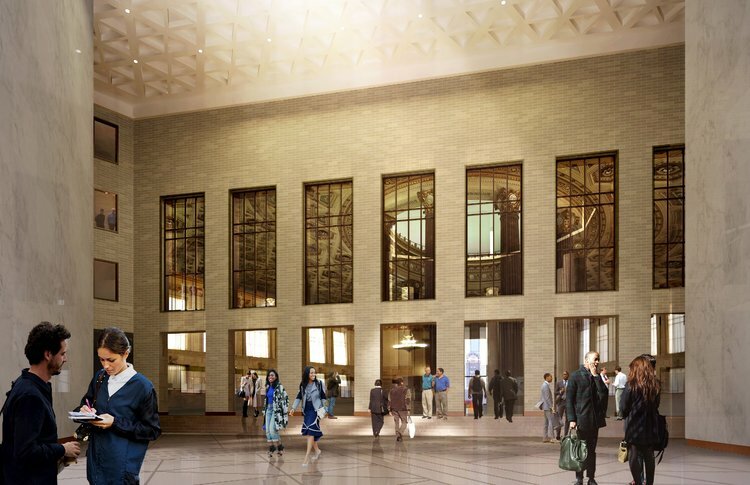 Adjacent to high-profile retail locations like City Point, Century 21 and Fulton Mall, 9 DeKalb Tower will feature valuable multi-level retail space that seamlessly incorporates the flagship-worthy Dime Savings Bank Building with new retail space at the base of the Project’s tower. 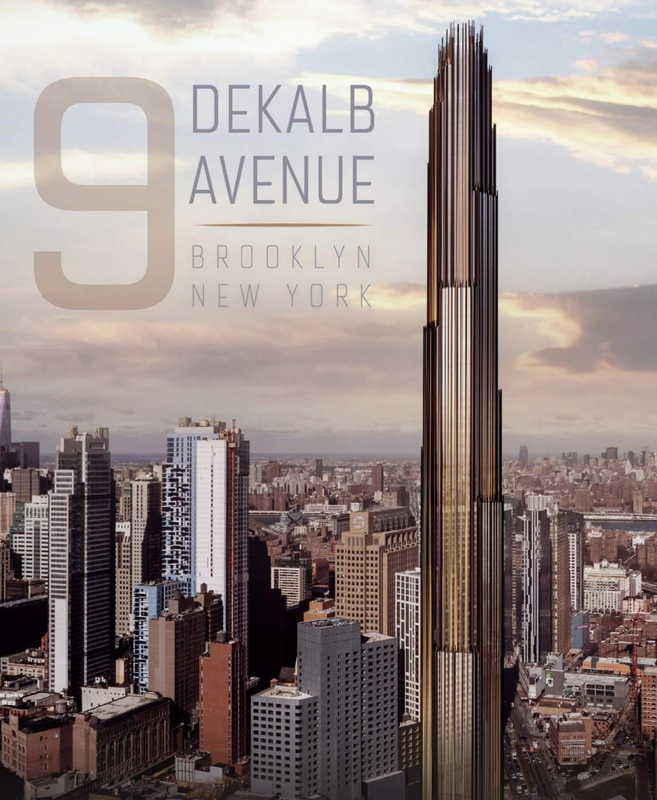 With an exceptional frontage at the heart of Downtown Brooklyn and a 1,066-foot tower above, 9 DeKalb will be the most visible retail destination in the borough. This project encapsulates everything that is great about Brooklyn’s rich past and everything that is fiercely elegant about Brooklyn’s future, taking it to new heights.